A balanced combination of introductory and advanced topics provides a new and unique perspective on the quantum field theory approach to condensed matter physics. Beginning with the basics of these subjects, such as static and vibrating lattices, independent and interacting electrons, the functional formulation for fields and different generating functionals and their roles, this book presents a unified viewpoint illustrating the connections and relationships among various physical concepts and mechanisms. Advanced and newer topics bring the book up to date with current developments and include sections on cuprate and pnictide superconductors, graphene, Weyl semimetals, transition metal dichalcogenides and topological insulators. Finally, well-known subjects such as the quantum Hall effect, superconductivity, Mott and Anderson insulators, and the Anderson-Higgs mechanism are examined within a unifying QFT-CMP approach. 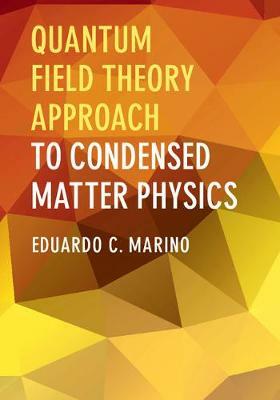 Presenting new insights on traditional topics, this text allows graduate students and researchers to master the proper theoretical tools required in a variety of condensed matter physics systems.